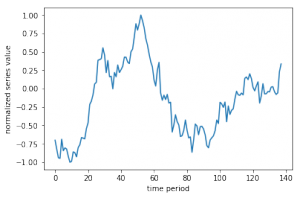 This fun project looks at predicting stock prices using recurrent neural networks on time series data. We can combine this with genetic algorithms for designing deep networks to get a good model for predicting things that rely heavily on past behavior. 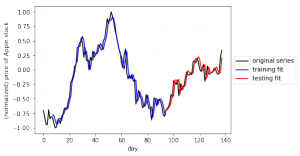 Historic Apple Stock Prices shown below in blue. This is daily stock prices since Apple’s inception. Below is our predicted stock prices for Apple. The first part, in dark blue is our training data. The part in red is our predicted stock price.